Kiyomi Lim's Site. : Dominos Pizza Singapore, don't you love them? Dominos Pizza Singapore, don't you love them? 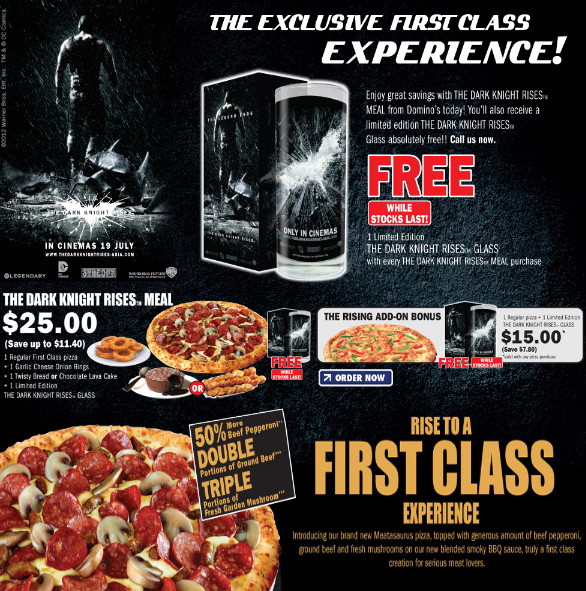 I've went for Domino's pizza's [The Dark Knight Returns] gathering with some other bloggers! & Many many familiar faces were there! I have been raving about Dominos Pizza since trillions of years ago.. ermm, ok, not so long, but, ya. & now it has a new Dark Knight Returns menu as well as their new high-class menu! With pizzas of much more ingrediants totally for meat lovers and people who loves strong flavours. I personally love thin crust pizzas and I love folding them up to eat them like sandwiches. I love the really thick crust pizza as well when I go with strong flavours. So after introducing this new menu to you guys, are you all salivating yet? If yes, go on and download that application on your phone or visit their website. If not, go on to "like" their facebook page first!